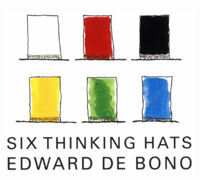 You can use Six Thinking Hats in meetings or on your own. In meetings it has the benefit of blocking the confrontations that happen when people with different thinking styles discuss the same problem. White Hat : With this thinking hat you focus on the data available. Look at the information you have, and see what you can learn from it. Look for gaps in your knowledge, and either try to fill them or take account of them. This is where you analyse past trends, and try to extrapolate from historical data. Red Hat : 'Wearing' the red hat, you look at problems using intuition, gut reaction, and emotion. Also try to think how other people will react emotionally. Try to understand the responses of people who do not fully know your reasoning. Black Hat : Using black hat thinking, look at all the bad points of the decision. Look at it cautiously and defensively. Try to see why it might not work. This is important because it highlights the weak points in a plan. It allows you to eliminate them, alter them, or prepare contingency plans to counter them. Black Hat thinking helps to make your plans 'tougher' and more resilient. It can also help you to spot fatal flaws and risks before you embark on a course of action. Black Hat thinking is one of the real benefits of this technique, as many successful people get so used to thinking positively that often they cannot see problems in advance. This leaves them under-prepared for difficulties. Yellow Hat : The yellow hat helps you to think positively. It is the optimistic viewpoint that helps you to see all the benefits of the decision and the value in it. Yellow Hat thinking helps you to keep going when everything looks gloomy and difficult. Green Hat : The Green Hat stands for creativity. This is where you can develop creative solutions to a problem. It is a freewheeling way of thinking, in which there is little criticism of ideas. A whole range of creativity tools can help you here. Blue Hat : The Blue Hat stands for process control. This is the hat worn by people chairing meetings. When running into difficulties because ideas are running dry, they may direct activity into Green Hat thinking. When contingency plans are needed, they will ask for Black Hat thinking, etc. A variant of this technique is to look at problems from the point of view of different professionals (e.g. doctors, architects, sales directors, etc.) or different customers.